Ce NORDHAVN est un yacht très confortable, il est en mesure de transporter en toute sécurité ses propriétaires et ses invités n’importe où dans le monde – dans le confort et le style Nordhavn. 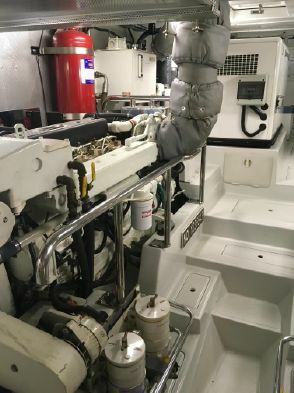 Il s’agit d’un navire bimoteur équipé de la stabilisation TRAC zéro (FINS), avec des propulseurs hydrauliques à étrave et à poupe commandés de façon incrémentielle (Hydraulic Bow & Stern thrusters). Cette combinaison de thrusters hydrauliquenpermet des manoeuvres précises lors de l’accostage (pas besoin de compter sur votre gouvernail lorsque vous manoeuvrez dans une marina). Ce Nordhavn est également équipé d’un toit rigide(hardtop) ce qui est très recherché. Ses panneaux solaires et son éclairage à DEL permettent une consommation d’énergie réduite et très efficace. Les premiers propriétaires ont naviguer principalement en Méditerranée, l’Europe et l’Océanie; Son troisième propriétaire (actuel) entame son 45e mois de croisière à bord, il navigue principalement entre les Exhumas (Bahamas) et la Nouvelle-Écosse. 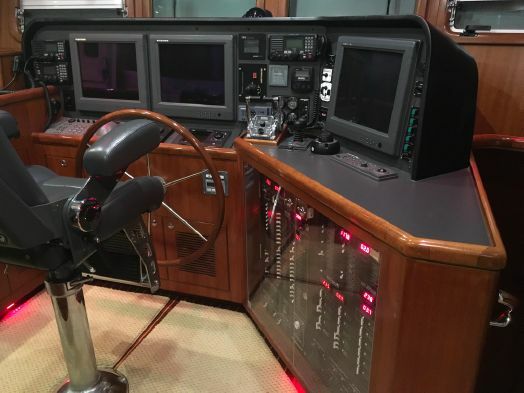 Ce Trawler d’exception (un Nordhavn 55) est entretenu de manière très méticuleusement et seulement des professionnelles travaille à bord à son entretien. 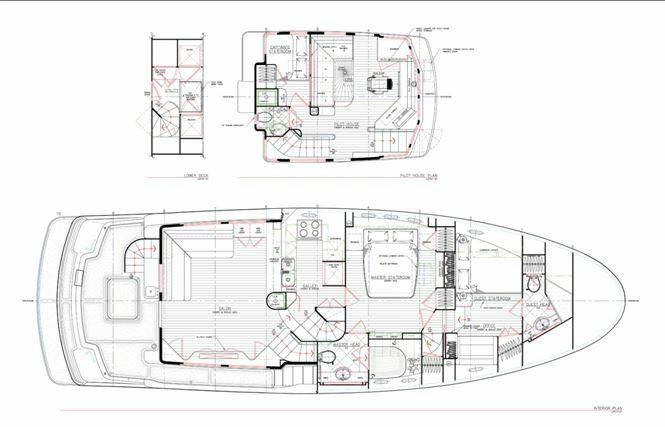 Ce Nordhavn 55 pieds est la coque numéro 25 et toute la documentation relative à l’entretien, ses déplacements sont bien sûr disponible. Vous aurez du mal à trouver un navire mieux équipé et mieux entretenu, il va dépassé toutes vos attentes. This NORDHAVN is a very comfortable yacht, capable of safely taking her owners and guests anywhere in the world – in comfort and style. She is a stabilized, twin engine vessel, with incrementally controlled hydraulic bow and stern thrusters. This combination allows for precise underway tracking, backing and close-quarters handling (no need to rely on your rudder when maneuvering into a marina or tight slip!). She has the highly desired hydraulic package, with dual PTOs, as well as the preferred flybridge hardtop. Her solar panels and vessel-wide LED lighting allow for efficient living on-the-hook. 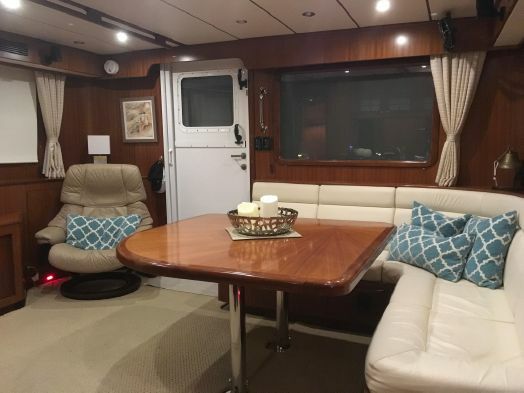 After her first owners extensively cruised her throughout the Mediterranean, Europe and Oceania; her third (current) owners are entering their 45th month of live-aboard cruising in the waters between the Exumas and Nova Scotia. 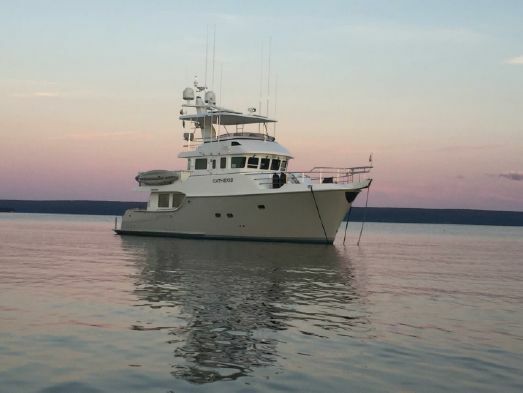 This trawler is a proven Nordhavn 55 that has been meticulously and professionally cared for. She is hull number 25 of Nordhavn’s most popular couple’s cruiser; and is a well-designed and extensively outfitted, U.S. Documented cruising yacht. 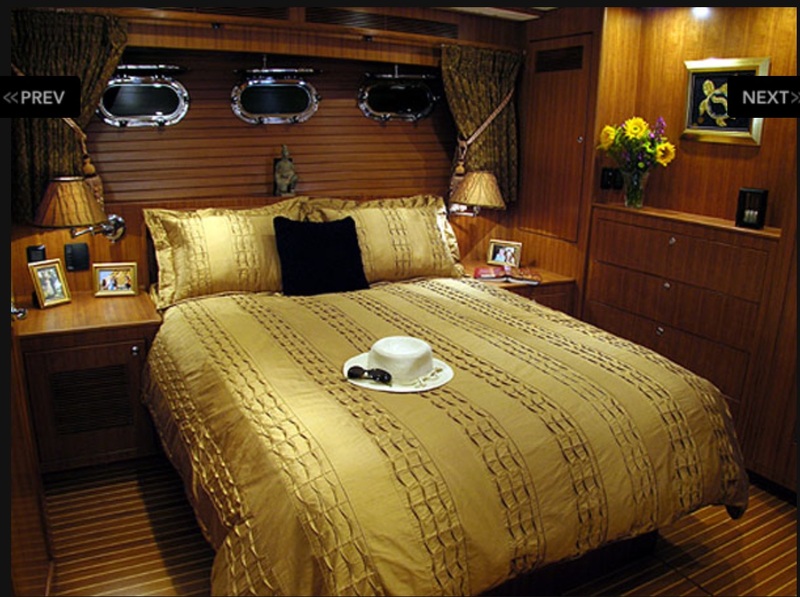 You will be hard pressed to find a better equipped, better maintained vessel of your dreams. 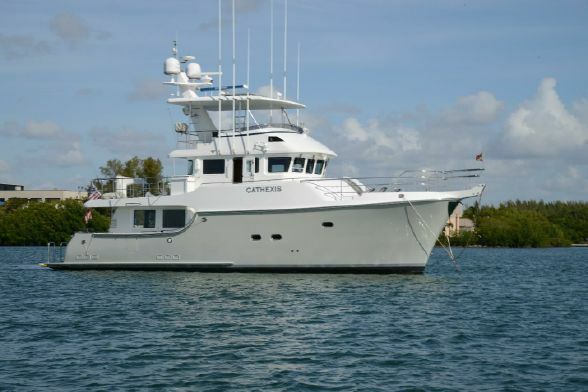 This NORDHAVN 55 is en route for Palm Beach (Florida), please contact us at 514-521-1221 for all details. Layout/Design DetailsThe cockpit opens directly to the main salon, which is outfitted with beautiful light cherry woodwork, custom tan carpeting, granite countertops and custom window treatments. A large L-shaped settee and varnished, oversized hi/low table are located aft to port. This settee has off-white cushions, covering large storage spaces. The oversized table adjusts to form a double bed (complete with fitted cushions) and also can be adjusted to provide the perfect distance from the settee to meet the needs of adults and grandchildren alike. Adjacent and to starboard are two, high-end, tan Ekornes “Stressless” chairs/ottomans. Fixed-mounted fans provide additional air circulation, if needed, on still evenings. 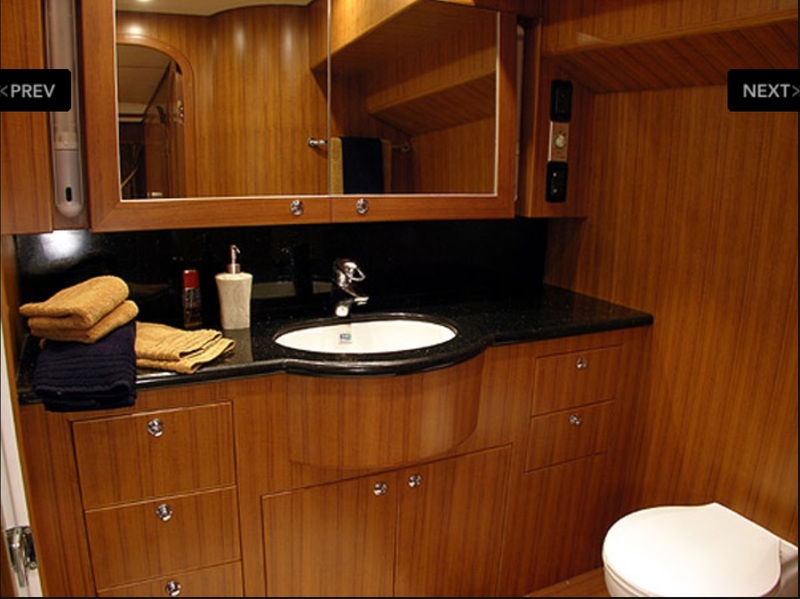 Port and starboard cabinets provide additional storage. The salon is outfitted with a 42″ flat screen TV, a surround sound system and Direct TV/DVD entertainment. 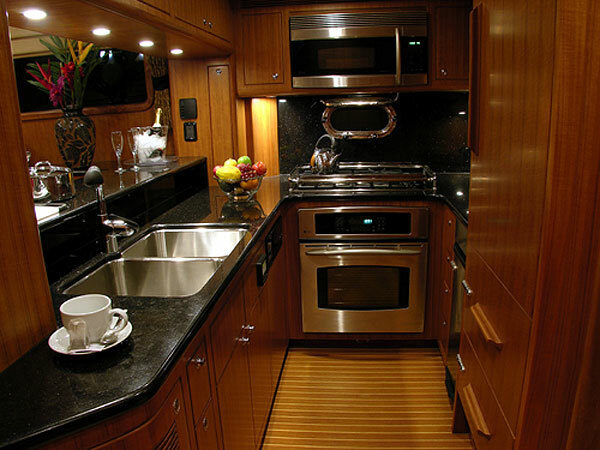 This entertainment system also controls speakers mounted in the cockpit, pilothouse and on the flybridge. Broadband internet and satellite TV capable, Cathexis permits real-world connectivity.The galley will remind you of home, complete with a Sub-Zero refrigerator, GE microwave/convection oven, gas cooktop, full-sized electric oven, double sink, pantry, plenty of cabinet space, granite countertops, custom backsplash and a beautiful slate-tile floor. 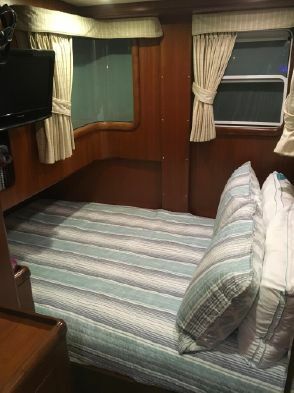 Excellent for extended cruising and liveaboards.Step down from the galley into a laundry/utility room, complete with its full-sized washer and dryer, chest freezer, stainless steel countertop/work area and storage drawers/cabinets. The stairway has removable steps, allowing full access to the large starboard stabilizer space. Aft of the laundry/utility room is the entrance to the engine room. With stand-up headroom, heavy duty stainless handrails and outboard mirrored stainless panels, underway engine checks are a dream. 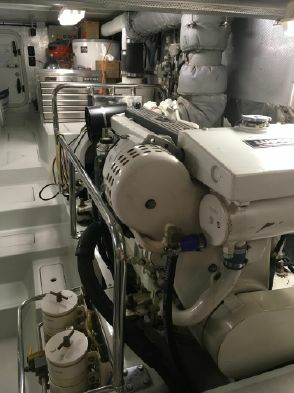 The twin, side-by-side Lugger engines are forward in this space, with the Northern Lights generator, 40 gallon water heater, dive compressor (with remote air intake) and full sized tool chest aft. 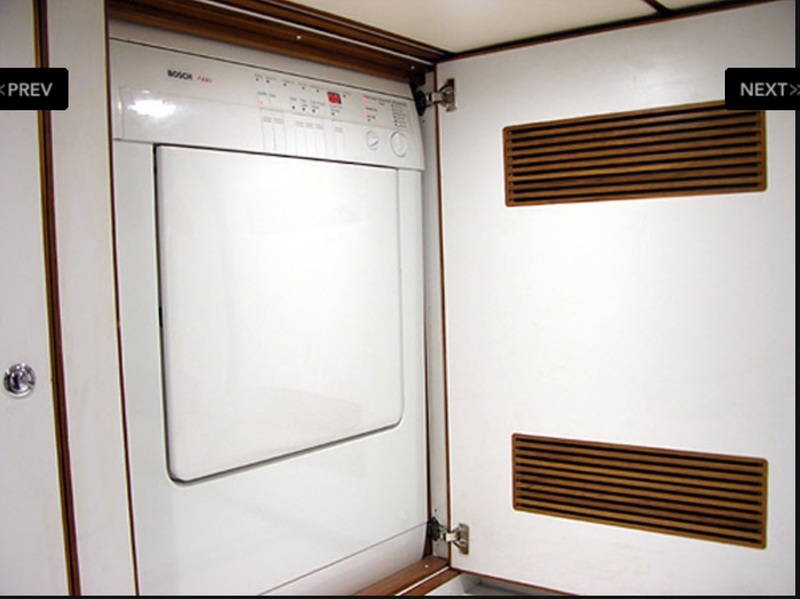 The Arid bilge system dries the bilge, even while underway. Continuing aft, you come to the lazarette (also accessible from the cockpit via an electronic lift system). 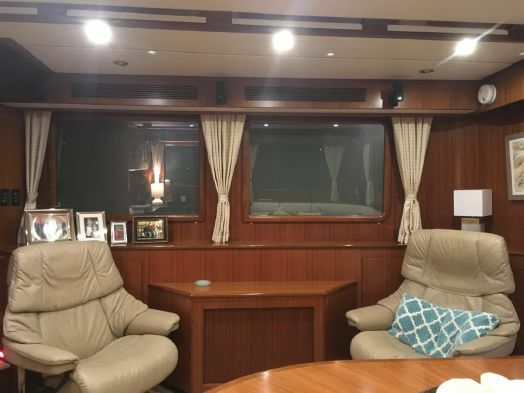 This is a large space which houses the battery panel, inverter/chargers, ASEA power converter and HVAC; as well as easy access to aft mechanical equipment. The lazarette provides ample space for spare parts storage as well as four dive tanks/mounting brackets. Forward of the galley is the master stateroom. 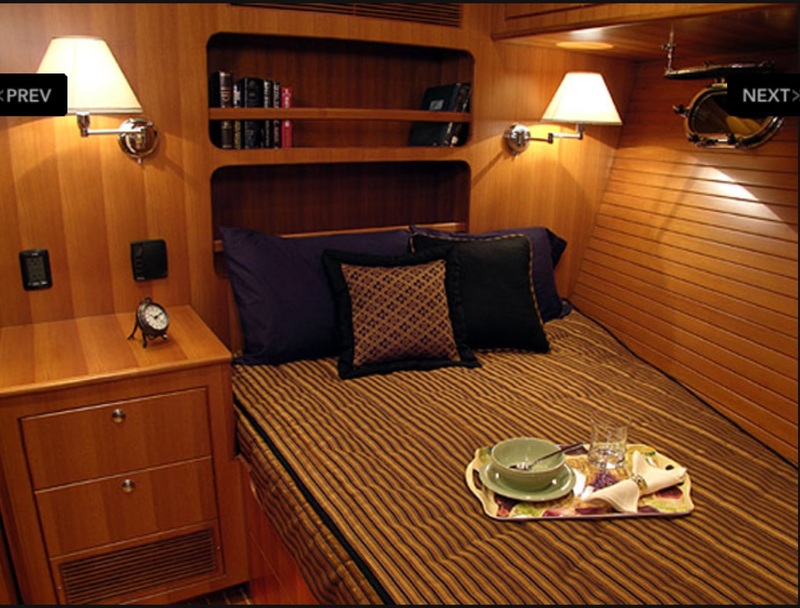 To port is a custom, queen-sized bed, flanked by two bed-side tables/cabinets. Beneath the bed are drawers and a large storage area for additional spares. Forward in this space is a large mirror, a full-sized bank of drawers and two large hanging lockers. There are also two wall-mounted ventilation fans, as well as a fan providing outside-air circulation. These fans augment the ample natural air flow from the three port side portholes and the ceiling vent hatch. 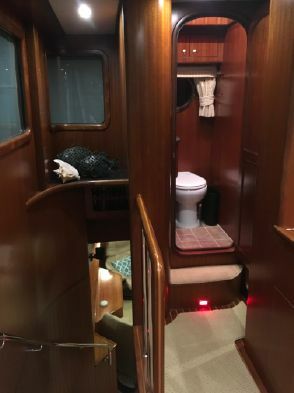 To starboard is a remote controlled 32″ flat screen TV and the master bath, complete with granite counter tops and a full sized shower and tub. Forward of the master, also accessible via the forward PH stairs, is a beam-to-beam, below decks spare parts storage area and a large hanging locker. 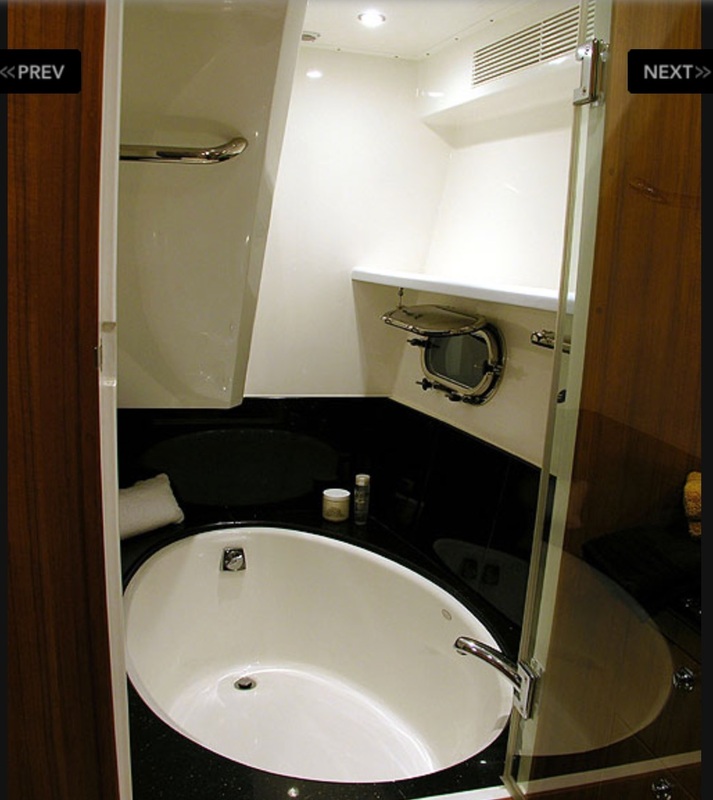 The VIP stateroom has a double berth, large lockers and drawers and two large ventilation hatches. 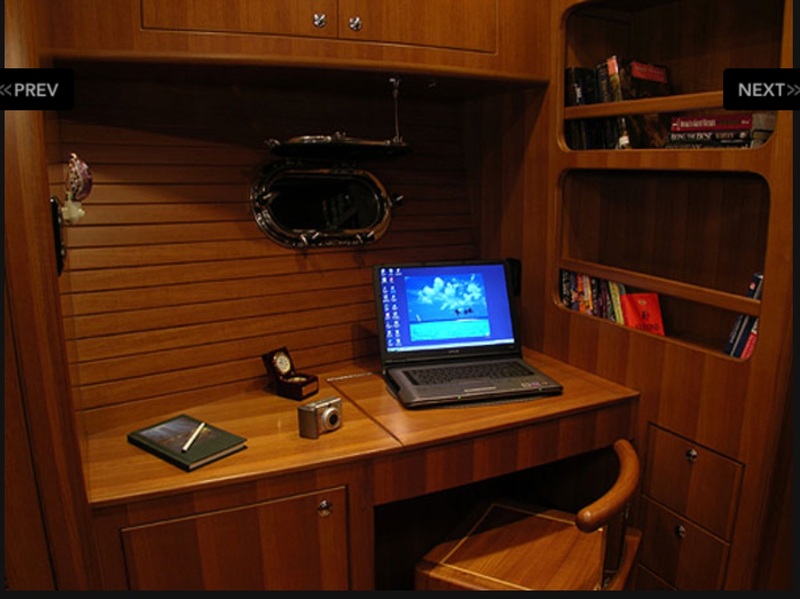 To starboard is an office area, with a mounted, swinging chair, desk and drawers. Forward is a full bath with granite counters, tile backsplash, drawers, large storage cabinets and another ventilation hatch. Below deck is a full-headroom machinery and spare parts storage area. 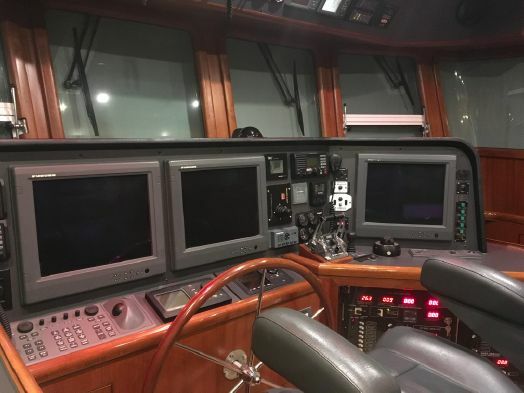 One deck up from the salon is the high-tech pilothouse, complete with its extensive array of electronic systems and controls. The visibility from the oversized, high-back Stidd helm chair is fantastic. A notable and desirable feature of this PH is its custom, raised settee, which affords a commanding view of the seaway ahead. In addition to the screened doors and operable windows, two wall-mounted fans provide on-demand ventilation on windless days. 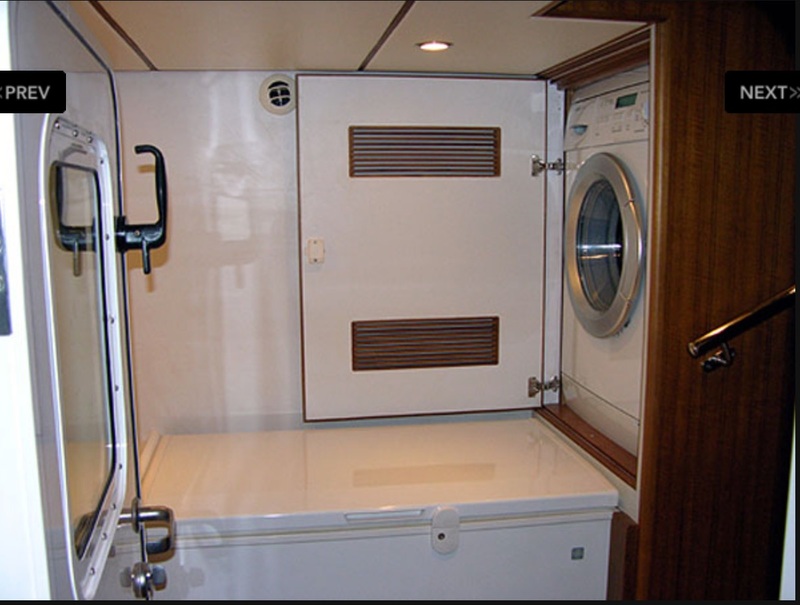 Aft of the PH, are a day-head, with granite countertops and a screened ventilation hatch, along with a captain’s cabin, complete with a double berth, shelves, drawers and a large locker. A wall-mounted fan adds ventilation to the large interior and exterior portholes. Exterior spaces offer some excellent features. 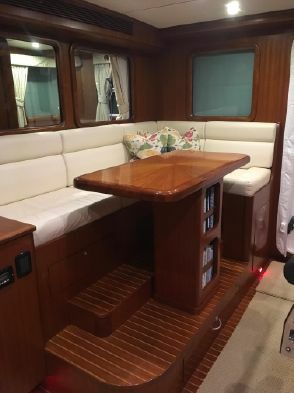 The cockpit has been redesigned to incorporate a spacious settee, with custom cushions and a fixed-mounted folding teak table. 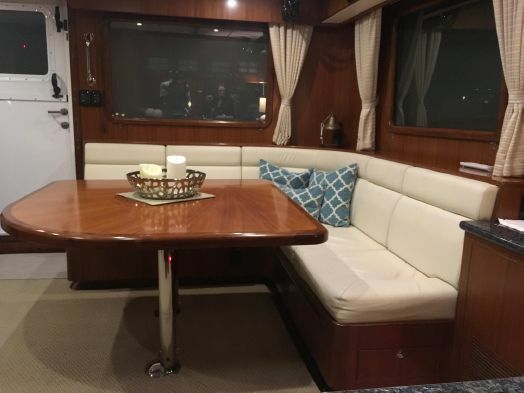 This converts the cockpit into a fantastic gathering place for entertaining, sundowners, or a quiet evening dinner with guests. The cockpit also has two reclining teak deck chairs that add to the enjoyment of this unique space. 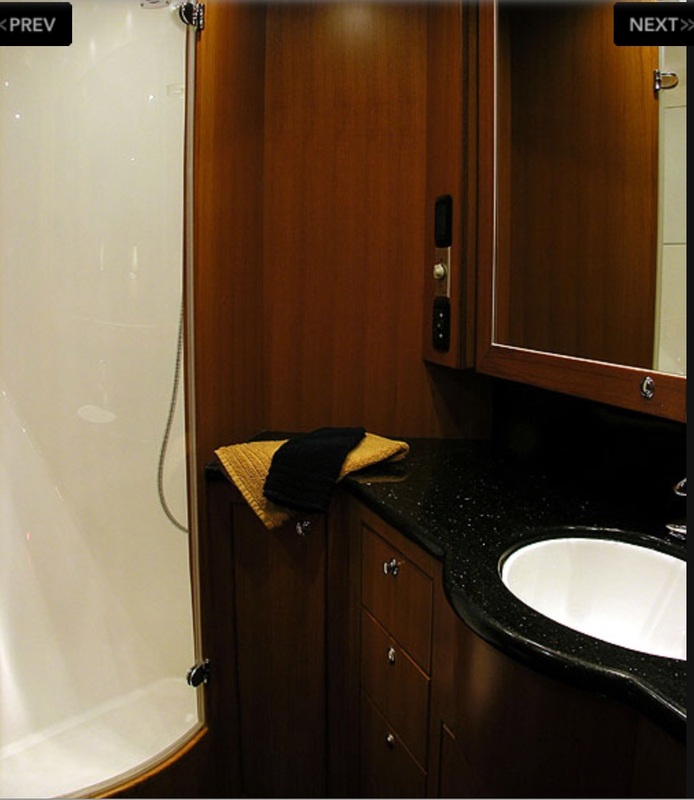 Two large storage lockers, a hot/cold outside shower and a large, motorized lazarette hatch complete this special space. Aft of the cockpit is an oversized swim/dive platform, complete with a dive ladder and a full shore-power station. Below the swim platform is a custom-designed wave dampener that virtually eliminates the annoying wave ‘slam’ that can otherwise result from following seas or ill-timed boat traffic. Below the swim platform are three, blue-toned underwater lights that are very effective at lighting an evening swim area. or attracting small, curious fish. The starboard side deck offers dock access and a protected walkway to the Portuguese bridge, a particularly well-protected area in front of the PH that effectively sheds even a rare blue-water visit. 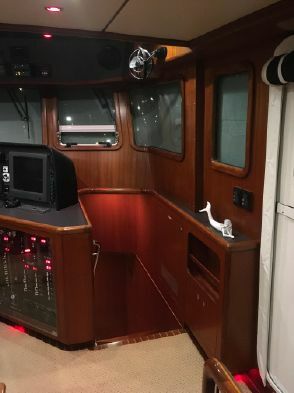 This area has two double door storage areas for power cords, mooring lines, hoses, plexi-glass storm windows, or most anything else that needs a home. 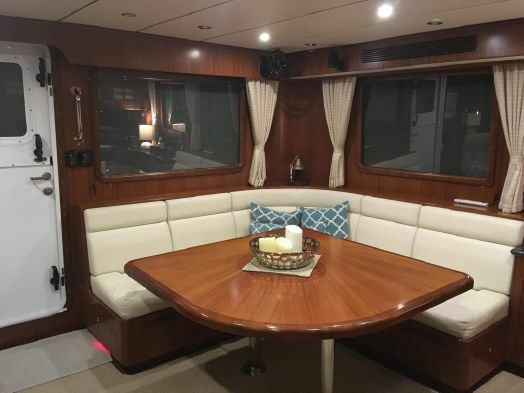 The foredeck is secured by robust stainless railings; and has an oversized windless and a 300 pound stainless anchor (for peace-of-mind if the unexpected squall hits your anchorage). Fitted to the railing are two, collapsible stainless fender storage brackets. There is also a full shore power station in the starboard foredeck bulkhead. The tender deck is located two steps up from the port side-deck, and is also secured by oversized stainless railings. Outboard of these railings, on either side and aft, are fixed kayak/SUP brackets that securely retain your largest water toys. The tender deck itself is very large, thanks to the well thought-out design change that eliminated the steps from the cockpit. This affords the opportunity to carry an oversized tender (for visiting distant harbors), completely within the railings surrounding the tender deck. This 14 foot tender is launched by a hydraulic davit, that retreats to a position athwartships and aft of the tender. The tender deck also contains three custom fiberglass deck boxes, suitable for dry storage of such items as folding bikes, tender fuel, cleaning supplies, folding deck chairs, etc. Completing the tender deck equipment list is a hydrostatically launched, hard-cased life raft and a passarelle. A fresh-water hose fitting helps make clean-ups easy. 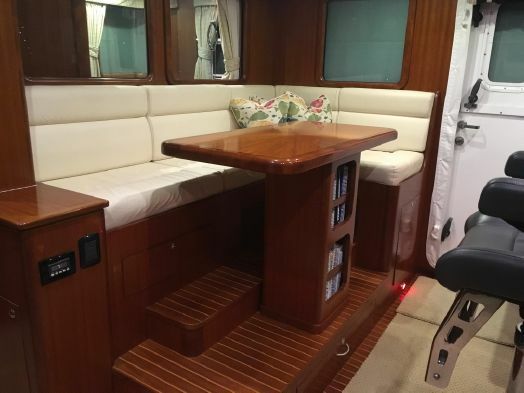 The flybridge has the very desirable hard-top upgrade. 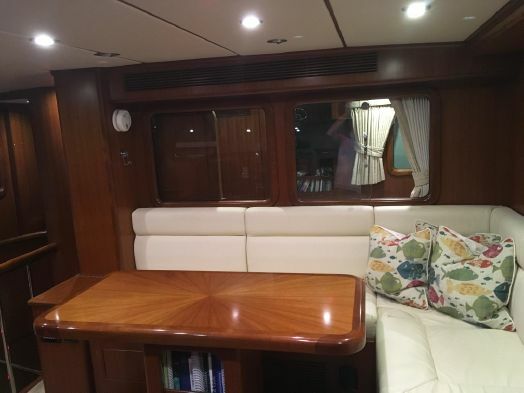 It is extensively equipped with navigation equipment, and outfitted with dual Stidd deck chairs, a starboard side settee and an forward-facing, full-sized settee and fiberglass table. 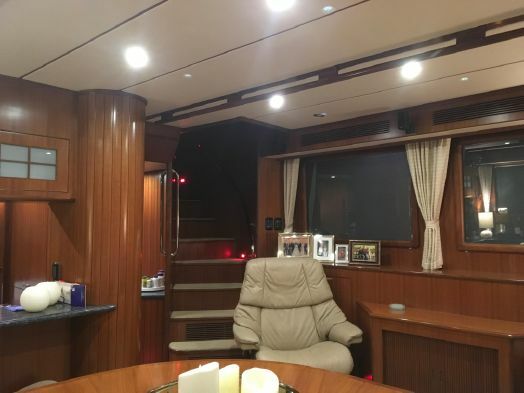 Other features include a beam-to-beam, storage area under the helm console, a full-width storage area under both the large and small settees, a tall storage area in the stack, a gas grill, and a refrigerator. The FB also allows for access to the top of the hardtop, which contains four large solar panels and extensive electronic equipment. 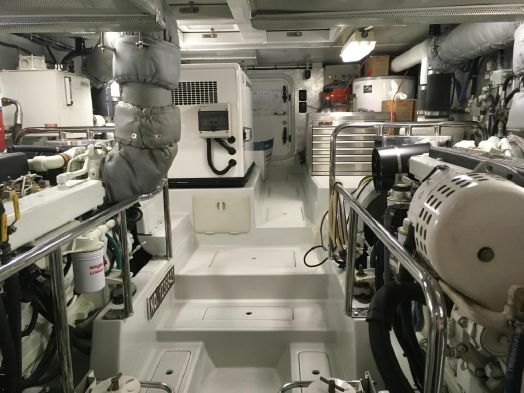 The hull, which was freshly painted during the October 2017 annual haul-out, has several noteworthy features. In addition to the wave dampener, hydraulic bow/stern thrusters, hydraulic stabilizers and protected twin propellers and rudders, the keel configuration helps ensure reliable, straight-as-an-arrow tracking. The combination of keep design, twin engines and hydraulic thrusters helps make boat handling very precise. Cathexis requires no rudder assistance to confidently enter tight marinas, pull into narrow slips (even with only inches to spare on each side), turn on a dime in a thoroughfare, reliably back in a straight line, hold her along a dock during mooring, and depart from an along-side tie, between two other vessels, into the wind. You’ll never cruise a better designed, more easily handled couples trawler! All in all, this is a very special yacht, proven through her world-wide cruising history. She is fully outfitted, and ready to safely and reliably afford her next owners a cruising lifetime of memorable experiences. ProprioYacht.ca et/ou Ita Yachts Canada Inc offrent les informations relatives à ce navire de bonne foi mais n’est pas en mesure de garantir l’exactitude de ces informations ni l’état du navire. Il revient à l’acheteur d’instruire ses agents ou ses experts afin de vérifier et de faire valider les informations de son choix. Ce navire est peut être offert sous réserve, il faut vérifier sa disponibilité. Ce bateau est peut-être offert en partenariat avec un autre courtier. 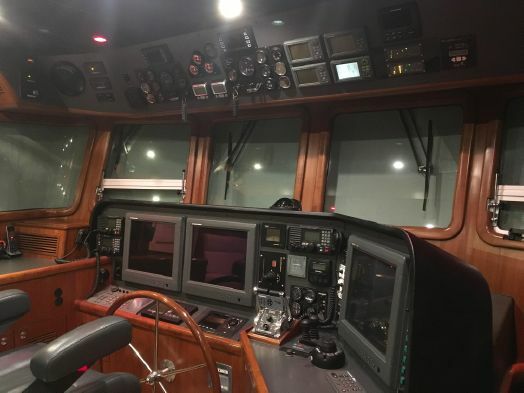 The Company ProprioYacht.ca and/or Ita Yachts Canada inc offers the details of this vessel in good faith but cannot guarantee or warrant the accuracy of this information nor warrant the condition of the vessel. A buyer should instruct his agents, or his surveyors, to investigate such details as the buyer desires validated. This vessel is offered subject to prior sale, price change, or withdrawal without notice. 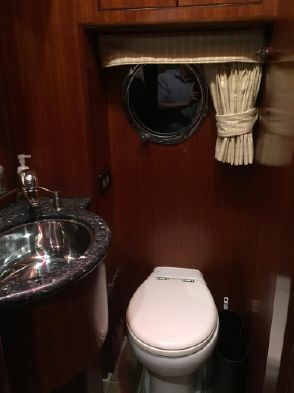 This boat may be listed in partnership with another broker.